Justin K. Thannhauser, New York. Sale, Sotheby’s, New York, 4 May 2005, lot 208. Paris, Galerie Louise Leiris, Pablo Picasso, Dessins 1959-1960, November – December 1960, no. 17 (illustrated in color). 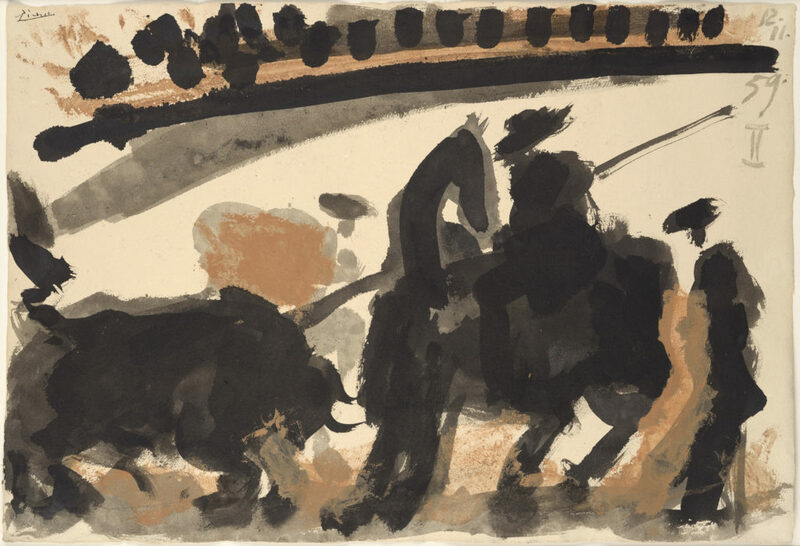 Sabartés, A Los Toros avec Picasso, Montecarlo, 1961, no. 17 (illustrated in color). Sabartés, Picasso: Toreros with four original lithographs, Montecarlo, 1961, no. 17, p. 150 (illustrated in color; titled The Thrust). Zervos, Pablo Picasso, Œuvres de 1959 à 1961, vol. 19, Paris, 1968, ed. Cahiers d’Art, no. 74 (illustrated pl. 18). The Picasso Project (ed. ), Picasso’s Paintings, Watercolors, Drawings and Sculpture, The Fifties II, 1956-1959, San Francisco, 2000, no. 59-302, p. 362 (illustrated). Zervos, Pablo Picasso, Œuvres de 1959 à 1961, vol. 19, Paris, 2013, ed. Cahiers d’Art, no. 74 illustrated.